I've read and listened to the first two books of this trilogy seven times. Even on the seventh I was learning new things! The depth of this book is unreal and the world Patrick Rothfuss has created is complex and beautiful. I can only speculate on what the third book will bring (and trust me, I do speculate). 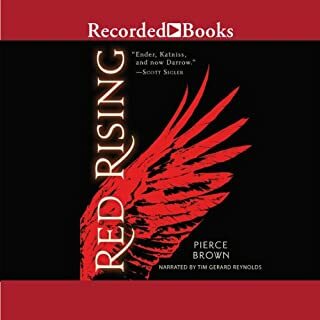 Plus I love Nick Podehl's narrating skills :D He was my first audiobook narrator and he set the bar high!! 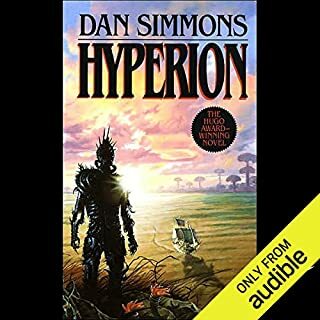 I loved the book, so I was thrilled to find the audio version. 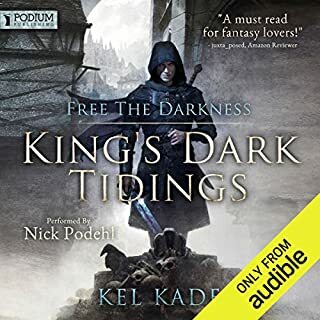 At first I wasn't sure about the speaker Nick Podehl but after the intro chapters and Kovthe begins his tale I really enjoyed his style a flare for reading. I recommend getting this if you loved the book, or if you have never read name of the wind. It is truly a modern classic for Fantasy. I read the paper copy and loved it, but couldn't get in to listening to it due to the narration. This is a good story though it gets stuck at some point and too long. The plot wont progress. Also at chapter 89 or 87 the recording gets cut and you miss a part of the book. In short, this book has excellent story-telling. I love the writing style and dialogue. I thought the story started out so well and that carried through a large part of the novel. I found myself anticipating that this would be one of my new favorites. I found however that at some point in the book the story just wasn't there. It didn't really seem to be going anywhere, and the end of the book was anti-climactic. 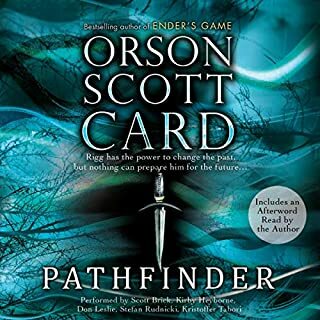 the overarching story seems to have a clear villian and some sort of worldly conflict, but this book only just barely hinted at it and so reading this book individually started to feel like a bit of a chore towards the end, leaving me unsatisfied when I finished. I will probably eventually read the next in the series though, so it did its job of hooking me in that sense. There's a whole lotta world building, and not much else. If world building is your thing, then this book is right up your alley. Don't get my wrong: well written and well performed, it's just that there isn't a whole lotta story going on. The narrator sounded about as big around as a broom stick and just couldn't sell the story for me. Maybe the story is ok in the end, but I wouldn't know. I couldn't make it past the first two chapters. Almost gave up on it. The narrator wasn't to my taste at the beginning but I am glad that I stuck with it! The story was very enjoyable and I learned to appreciate the narrator's skillset. 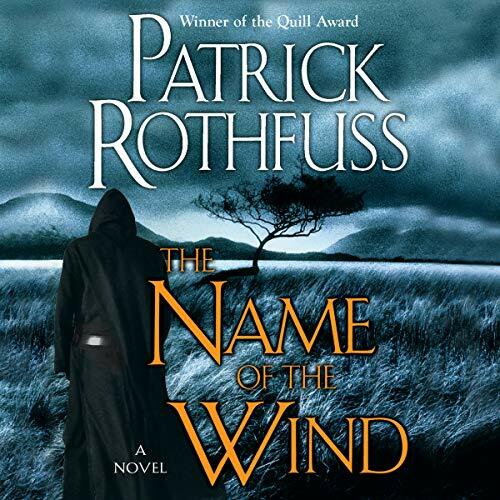 Only surpassed by the following one, The Wise Man's Fear, The Name Of The Wind is undoubtedly the most well-crafted fantasy story of this century, so far. It's too bad the telling does not always fit the writing. Some are too much, other not enough. Yet it was to be expected. Plus it's not that bad at all. The story is good, a bit too long sometimes. It keeps me attracted till the end, by curiosity more than by interest. Loved it! The beginning was a bit slow but 3 hrs in the story starts to unfold giving one of the best looks at a young wizard growing. No Harry Potter luck but instead a more emotional look at what a young boy who is self aware goes through. This isn't the kind of book I would normally pickup or download but a co-worker recommended it to me. Wow! Where to begin? The story itself is beautifully written. The author weaves stories within stories to create a fabric of fiction as warm and familiar as a favorite blanket. I was immediately reminded of Neil Gaiman's writing. I always joke that if I were diagnosed with a terminal illness that I would want Neil Gaiman to come to my house and read to me from one of his books as I cuddled up with my pound puppy in bed. (A little dark but you get my point!) I've added Patrick Rothfuss to the list as well. It's one thing to have a mind that can image, in great detail, an entire world and culture but it is a true treat to find an author that can both create and pull you into that world and make you feel like you are a part of it. I was afraid it would be too "fictiony", too many fairies and dragons. I'm not sure how but Rothfuss manages to incorporate them both without the story becoming too "fake". There is a certain harsh reality within the story that sharpens the sometimes softened edges of fiction. Excellent writting! Nick Podehl's reading is spot on! The character voices are wonderful. Not over the top but obviously performed. It's like having a great actor perform a great play. It's the perfect pairing. I can't wait to start on the second book. Enjoy! Not sure why the reviews are so polar opposite. So it looks like people either love or hate this book. 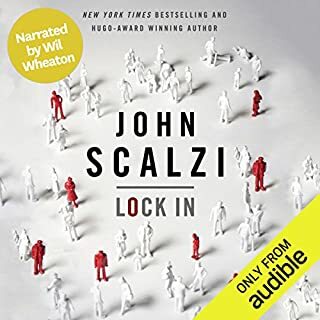 I loved it and actually got the audio book just so I could write a review and listen to it before the next one comes out. Maybe it is because I read the actual book, but this is the first book I have read in a long time that I just could not put down. I read the whole thing in 2 days. 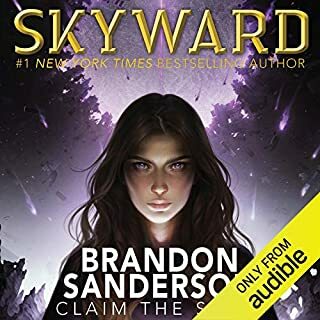 It is true that this first of the trilogy is really just character development and setting the stage, there is not a whole lot of action yet, but I swear while reading it I felt like I was sitting there at the table with them and that is due to the incredible writing style. The way this book sucked me into it's world is amazing. I have read all the other greats of this genre and while many of them are wonderful, I never felt as attached to them. This review covers the first books of the series Kingkiller Chronicles. Some fantasy can be exhausting: Dan Simmons, Brandon Sanderson, George R. R. Martin, Robert Jordan, even sometimes Neil Gaiman. Their stories can take your breath away but sometimes, also, knock the wind out of you with a force. Patrick Rothfuss is not about that. He is more about an easy-going kind of entertainment. These books do not knock you over with amazement, epic wars or adventure. They are more subtle and a great richness comes through in that subtlety. While usually light, do not be fooled; they contain a depth and richness that is just easy to read and easier to appreciate. This is nothing short of outstanding fantasy prose and character development. These stories are long but not too long. Rothfuss does not ramble. The continuity of the protagonist Kvothe’s stories is there but not so complex or convoluted that one can get lost over the span. While there are many characters there is a core of them that are easy to know and become invested in. The stories are more about people and their relationships than about what the wizard-in-training is actually learning and practicing. At least the first two books do not contain that much magic but they do not leave you wanting either. They only leave you in great anticipation of the next book to come in the series. Nick Podehl’s reading is impeccable. I am loathe to say this is a great book for YA’s for fear it might deter older readers from venturing here. That would be a mistake. These are great books for readers of all age or gender. 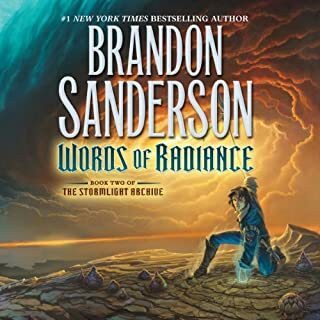 Though I mention this is the best fantasy book since Mistborn, it is nothing like mistborn and that's what makes it so great. The book revolves around an inn keeper (living in hiding) having the memoirs of his life taken down by a scribe. It follows the first 15 years of his life. From tragedy that sends him to living on the streets to his attending university. This is the first book in the series and at the end you are left with more questions than answers but somehow you are still left satisfied while eagrly awaiting book 2 due out in December. The author creates these amazing adventures for the young protagonist whilst slipping in litle details that slowly forms a picture of much larger forces at work in the background. The book also focuses alot on descriptions of music, arts, and magic. I must truly say that this author decsriptions are like painting pictures of these things in your mind. For comparison, if you've read "Eragon" the descriptions of magic are very logical and explanatory, while in the book, the description magic are like poetry. This made the book new and refreshing. What can I say about the narration but "Bravo!". If u like Eragon, Harry Potter, Mistborn give this book a try. If you don't like the afore mentioned books, I'd still recommend that you give this book a try. Finally! A fantasy author who can write! So many fantasy novels, though their concepts are interesting, are ultimately mediocre at best, largely because they are written as clumsily as might be expected from an eighth grader with a C in English class. 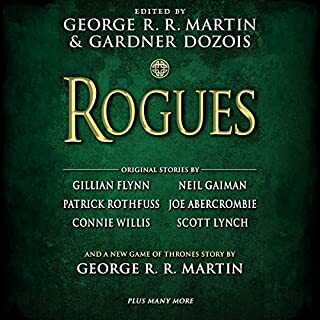 Rothfuss has joined the very, very small group of fantasy authors (think Tolkien, Martin, Gaiman) who can not only build an intriguing world and spin an interesting story, but who can also use the English language with elegance and verve. His dialogue, expression of ideas (yes, there are IDEAS here, not just plot and character and setting), and description are written at a level that is appropriate for a well-educated adult. 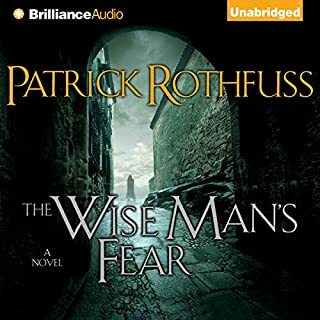 Rothfuss uses a frame narrative, which is somewhat unusual for a fantasy novel, and which he handles with such skill that it greatly adds to the suspense of the story. His system of magic is well-conceived and not oversimplified, and his characters, though sometimes of mythic proportions, are never cliche. He builds a nuanced and believable world without the cardinal sin of "infodumping." In short, he has provided everything for which a serious lover of fantasy literature (as opposed to fantasy genre fiction) can ask. If you look at this as a debut writer who is going to grow in his talent and if this is his first novel then it is great. If this is an experienced writer or someone who just changed his pen name then it is average to good. If you read some early Koontz and Gerrtisen then you will find they did not start the great writers that they are today. What is Great? PR can paint a picture in your mind better then most writers I have read. I am literal minded and often have problems with flowery language and picturing in my head what the writer is explaining, but with this book, I always had a very vivid picture of the characters and the scenery. PR himself got into my head. Over half way into the book, when things were going well for the main character, I remember thinking, nothing ever goes this well for Kyothe for this long without something going wrong, so when is the other shoe going to drop? That was the exact words that ran through my head. Not a minute later, Kyothe thinks to himself, things are going to well, when will the other shoe drop? Some of his writings stirred my emotions, made me tense, made me hear the music, made me want to shake Kyothe and tell him to snap out of it, like Kyothe was a real friend of mine, who I wanted to help. Good: At times there is great insight. For example, at one point he explains that if you can make a women feel beautiful, not just say it, but make her actually feel she is beautiful and then she sees in her own mind that she is beautiful, she will act beautiful and other people will see her as beautiful. I am a strong believer in this and I have seen it happen in the lives of some close to me and I have seen the opposite. The mind is a powerful thing. The book has dragons, magic, wizards, underground tunnels, buildings with hidden rooms,etc. Average to bad: Often the story does not seem to be going anywhere. It is not clear what the goal is. There are no character goals, no quest, no reason to keep listening. One reviewer wrote that you get this happened then this happened then this happened, I agree. At almost 28 hours it took me a week to get through it. I found that each day I did not dread having to listen or get impatient, but I also found I had no great desire or want to hear the story. The story seems rather disjointed at times, one minute we are facing this problem and then it is totally forgot and we are off to some other problem. Many problems do not get handled. I did not care for the story in a story or even the story in a story in a story. The beginning, interludes and ending are distractions. Sometimes the writing is a little sophmoric. As the writer matures I believe these mistakes will be taken care of in future writings and I believe PR has the potential to be a great writer. Well... i started my audio experiance on Robert Jordan's Wheel of time. 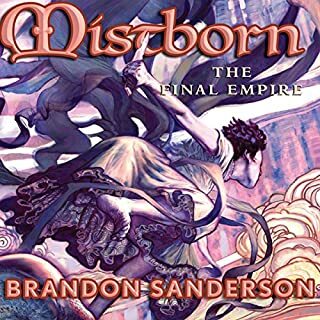 Then Brandon Sandersons mistborn series..then George R.R. 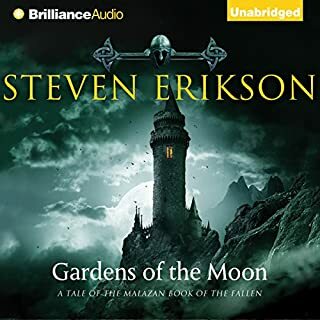 Martains song of fire and ice... from there i bought books and they didnt match those 3 authors talent and story telling, i thought i would never get the story writing those autors gave me ...until now. 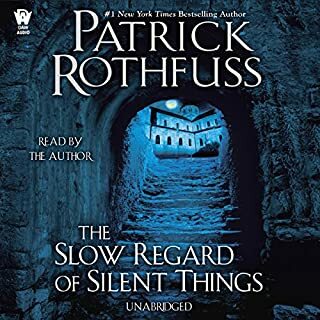 Patrick Rothfuss's writing style and story telling is awesome I found it hard to put my headphones down at the end of the day...and the narrator is one of the best i heard to date. I recomend this book. you wont be disapointed!! This one had been on my "need to read someday" list for a long time and I finally took the opportunity to see what all the hype was about. The book takes on something of an interesting structure - most of it is a first person narrative of Kvothe essentially sharing his autobiography. 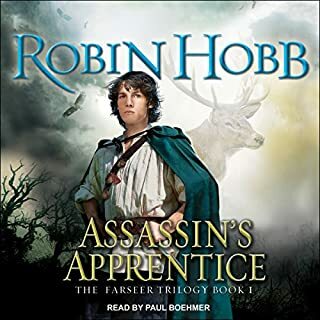 This first book covers his story from early youth part way through him time studying at the "Arcanum" - a university like school where Kvothe has made his way to study both practical and arcane arts. This book is a little different from the typical first person narrative in that it starts and frequently returns to being a third person story - set in the "present" from when Kvothe is recounting his history to a man who collects such stories and has sought him out. 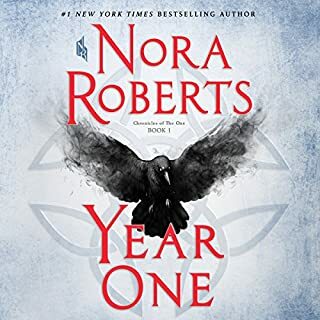 This first book, particularly towards the end, suggests that this series may eventually move beyond a focus on telling Kvothe's history and moving forward again in the present. Hopefully, this change comes soon. 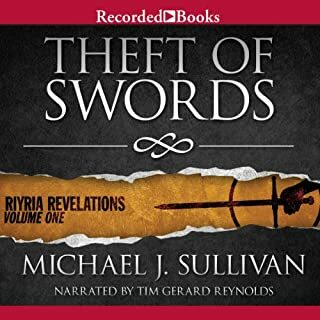 While Kvothe is a somewhat interesting character so far, the story suffers as all first person narratives do. It feels more like following a character walking through a very linear video game. Kvothe recounts a string of episodes that he goes through. Because he is the only character we follow directly, the author is burdened with having him carry all the action. This leads to a string of extraordinarily good luck as, while Kvothe has the occasional setback, he mostly goes along outwitting one hapless adversary after another. Combined with the fact that Kvothe is never in any real danger - since he's the one telling of the events many years after the narrative takes place - Kvothe is ultimately a diminished character and it is hard to really care about him as much as I'd like to. I'll probably check out the next book at some point, but this experience didn't really leave me with a strong desire to immediately seek out the next book. 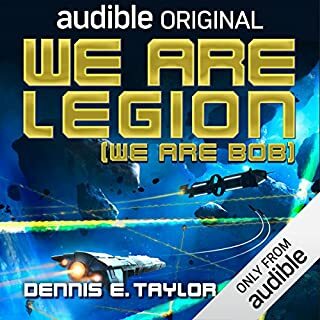 As an audiobook, I do have to admit the narrator did make the story much more bearable. I don't think I would have finished the book if I were reading a hard copy. 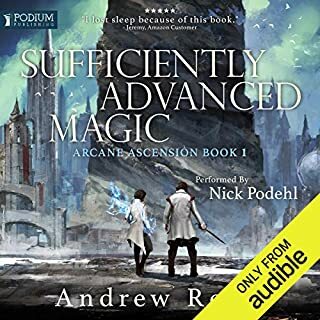 Nick Podehl does an excellent job with the material he's given and brings more life to Kvothe and the other characters than the written text itself manages on its own. The beginning of the story is slow. The way the characters are introduced makes it hard at first to follow the story. However, after the story gets going, it becomes very interesting. I am waiting for Days 2 and 3. Other series you may like: Trudi Canavan's Black Magician series - She also wrote a trilogy that isn't on audible - Voices of the Gods/The age of the five/ that is also pretty good. 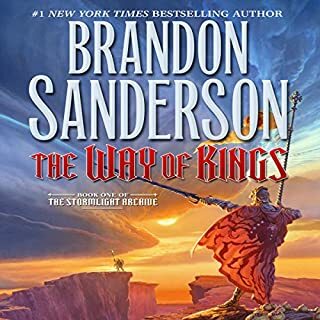 Of course, this assumes you have already read The Wheel of Time by Robert Jordan, George R. R. Martin's Song of ice and Fire : Beware - no one is sure when this series will be finished, and Brandon Sanderson's Books - Elantris, Mist Born Series, and Jim Butcher's Codex Alera series. If you have already read all of the above books, try Jim Campbell's Lost Fleet Series. You may also enjoy Sharon Shinn's Thirteen House series. Now I will say that everything is NOT for everyone. So, read other reviewers and hear what they have to say before you decide. I have enjoyed the above series - although I enjoyed some a lot more than others.